John Suchet plays a piece from a new release after 10am every weekday. King of the Waltz and expert showman Andre Rieu sweeps his millions of fans off their feet again with this new album of the greatest love songs ever written. The tracklisting includes film hits such as My Heart Will Go On from Titanic and Cavatina from The Deer Hunter and timeless classics such as Hallelujah by Leonard Cohen and Scarborough Fair. The album comes with a DVD which includes two hour-long Andre Rieu concerts. As you'd expect, these are huge spectacles of the kind where 100 horses and a corps of trumpeters and percussionists parade in front of Andre's adoring fans. There's even an appearance from Andre's son Pierre. John Brunning plays pieces from a new release after 6pm every weekday. Bill Turnbull - breakfast news host and for the past six months, weekend mornings Classic FM presenter - has personally curated three CDs' worth of the world’s most beautiful and relaxing classical music. Popular classics such as The Pearl Fishers duet, Barber's Adagio for Strings and Pachelbel's Canon are performed by some of the biggest names in classical music: Joshua Bell, Leonard Bernstein, Placido Domingo, the New York Philharmonic Orchestra, Lang Lang and more! The celebrated French trumpeter Maurice Andre loved to claim the lung-power required to play the trumpet like he did was sufficient to inflate a lorry tyre! The fragrant Alison Balsom looks too fragile to blow out the candles on her birthday cake, but in fact gives Maurice a good run for his money in repertoire so beloved of French trumpeters, that for trumpet and organ. There are eight Bach chorales here, where she is partnered by the veteran Stephen Cleobury on the organ of King’s College, Cambridge. The world-famous King’s Choir join them for a charming performance of Jesu, Joy of Mans Desiring, and Balsom and Cleobury sound especially fine in Sleepers Awake. The rest of this thoroughly enjoyable album is given over to baroque trumpet concertos, or arrangements for trumpet and orchestra. Here Balsom eschews the modern valved trumpet in favour of a baroque valveless instrument. And she sounds really well in music by Torelli, Fasch, and an arrangement for trumpet and orchestra by Stephen Wright of Corelli’s famous Christmas Concerto, itself worth the price of this CD. The Academy of Ancient Music accompany attentively. This is a quite exceptional recital, chosen by the singer, who also contributes an interesting note about why these 14 pieces mean so much to her. DG have obviously not found it easy to crystallise her explanations into a single PR sentence. The best they can manage is to call it: “A personal celebration of the indomitable nature of the feminine spirit.” As for “revive”, well I haven’t a clue. But what I do understand is that on this evidence Garanča is turning into perhaps the exceptional mezzo of her generation. Since I first heard her, as a very young woman, her voice has filled out, taking on a true mezzo timbre, rather than just sounding like a sort of soprano, which so many mezzos do. So, what she calls the key track on this album, the big aria from Cavalleria Rusticana, sounds much more potent sung by her, with her powerful chest notes, than by most, lighter toned sopranos. What is also interesting here, reflecting the personal nature of her choices, is the obscurity of some of the arias selected. It’s not every day you hear one from Saint-Saëns’s Henri VIII, or Massenet’s Hérodiade. She plainly enjoyed the experience, or so she says of working with the Valencia Orchestra under Roberto Abbado, and this album, primarily of Italian and French material, should be sought out by any connoisseur of the voice. It left me wishing we heard Garanča more often in London. What are you playing at, Covent Garden? 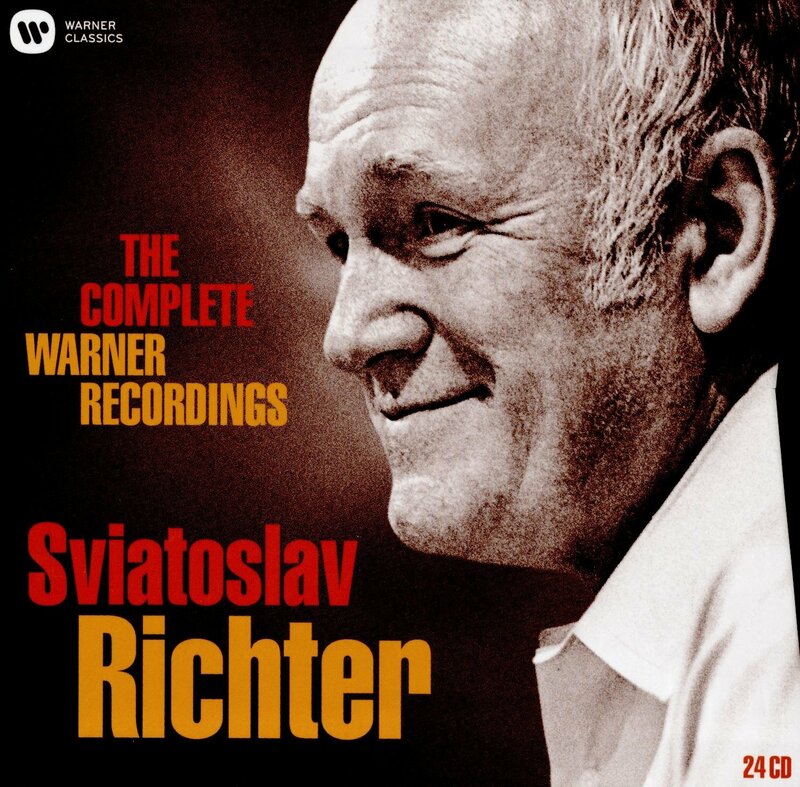 Sviatoslav Richter (1915-97) was one of the great post-war pianists. Some would say the greatest, though others, myself included, would make a case for his compatriot Emil Gilels, whose centenary it is this year. It was of course Richter’s centenary last year, so this can be seen, maybe, as a bit late. But once again, you don’t need a special reason to play Richter. He is a pianist who always had some light to shed on everything he played, even when, as is sometimes the case here, he is being wilful and eccentric. Richter’s teacher Heinrich Neuhaus described Richter as surveying the totality of the pieces he played from a great height, like a hawk. It’s certainly true, even when Richter is taking a different view from most of his colleagues, he is always compelling, and always respected the structure of the piece. And of course, his prestidigitation was phenomenal. So what we have here are powerful pieces by Beethoven and Mozart - the Triple Concerto and Piano Concerto No.22 for instance - and also lighter stuff such as the Grieg Concerto (though it’s not one of the most noteworthy performances on this album), and Dvorak’s neglected Piano Concerto, where he is partnered by none other than Carlos Kleiber. More rewarding are some of the chamber music performances with the Borodin Quintet - The Trout, Schumann’s Piano Quintet - as well as exhilarating 20th century concertos such as Bartok 2 and Prokofiev 5. This is best treated as a lucky dip. Sadly not all that much of his best work was done for EMI (now Warner), and he was also undoubtedly one of those musicians who usually gave of his best live, rather than in the clinical conditions of a studio. And, of course, there’s a mass of live recordings by Richter in circulation. Voces8 has produced some exceptional albums, and this may be the best of them. Here, the eight voices are joined by a small instrumental ensemble to perform music primarily by northern European composers such as Peteris Vasks and Arvo Pärt. The theme is winter, which means it does include some Christmas material, like Jan Sandström’s arrangement of Praetorius’s Es ist ein Ros Entsprungen, and Holst’s In the Bleak Midwinter, alongside other stuff that has no religious connotations like Vasks’s Plainscape 1-3. Perhaps this is more for the choral connoisseur, rather than the beginner.